Solid, noncombustible items can be turned into combustible dusts during manufacturing processes like food prep (grinding, transferring or mixing ingredients), machining (sawing, grinding, drilling) or finishing (buffing, polishing and abrasive blasting). 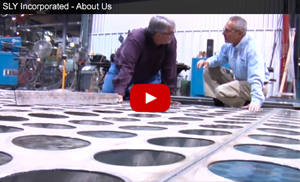 These processes can produce massive quantities of suspended particles. Electrical devices or processes that can produce sparks or heat can trigger explosions, especially in areas where poor housekeeping practices have allowed dust to accumulate. These explosions can be disastrous in terms of destruction, injuries and deaths. For example, an explosion and fire at Imperial Sugar Refinery in Port Wentworth, Georgia, killed 14 employees and hospitalized 40 others. Fortunately for manufacturers, choosing the right dust collection solution and the right provider can reduce the likelihood of catastrophes. Dust explosions can occur in any industrial manufacturing context where these five risk factors are present. Sly’s newest guide, Using Wet Scrubbers for Combustible Dust Control, outlines the wide range of combustible dusts and explains how the use of a wet scrubber rather than a dry dust collection system can lower the risk of a dust explosion. It also provides an overview of the types of wet scrubbers available, as well as precautions and guidelines to follow if your facility must use a dry dust collection system instead of a wet scrubber. At Sly, we work closely with our customers to evaluate their application in order to design the best solution for their specific needs. 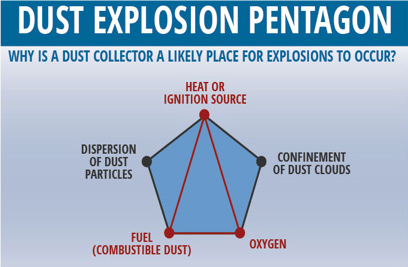 Even if you already have a dry dust collector installed or your application limits you to a dry dust collector, you can still reduce the chances for a dust explosion by following the advice in the guide. Download your copy of Using Wet Scrubbers for Combustible Dust Control to learn more about how to safeguard your facility and the people who work there. If you need help upgrading your approach to dust collection, contact us or request a quote.